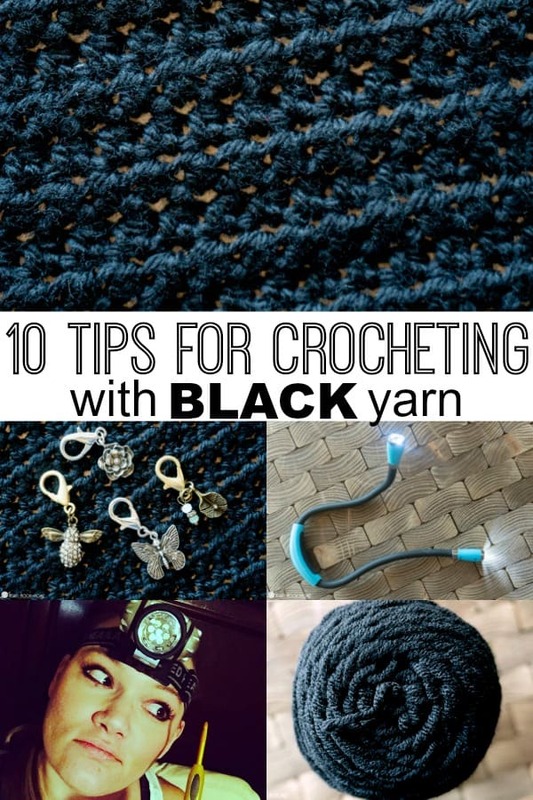 Whether you’re crocheting with black yarn as a special request, or you’re just glutton for punishment, here are my my favorite tips for working with black yarn. Do you avoid crocheting with black yarn? 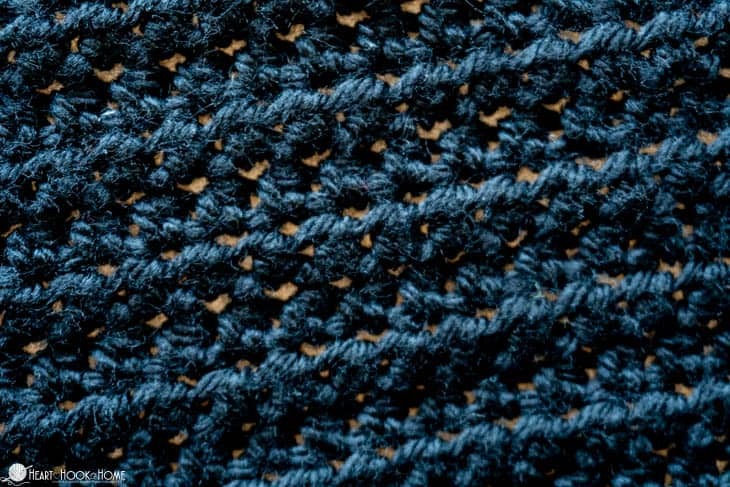 I’ll be the first to admit that crocheting with black or dark yarn is not the most enjoyable, but I’m also a sucker for an elegant black shawl, scarf, or cardigan. 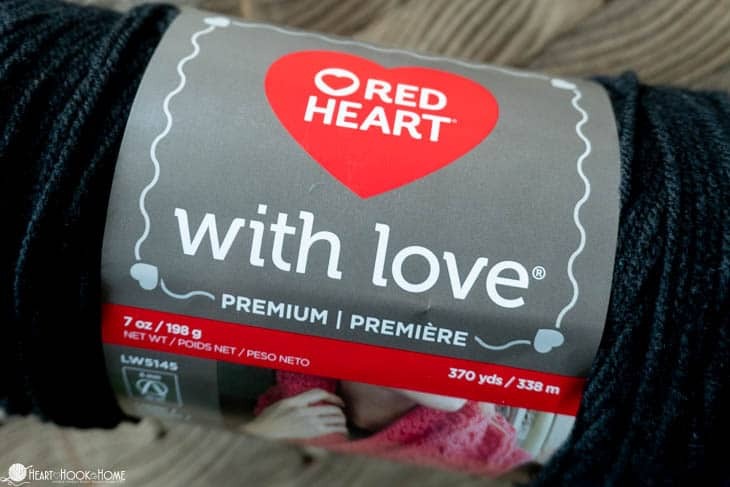 My favorite black yarn for everyday use is Red Heart With Love. 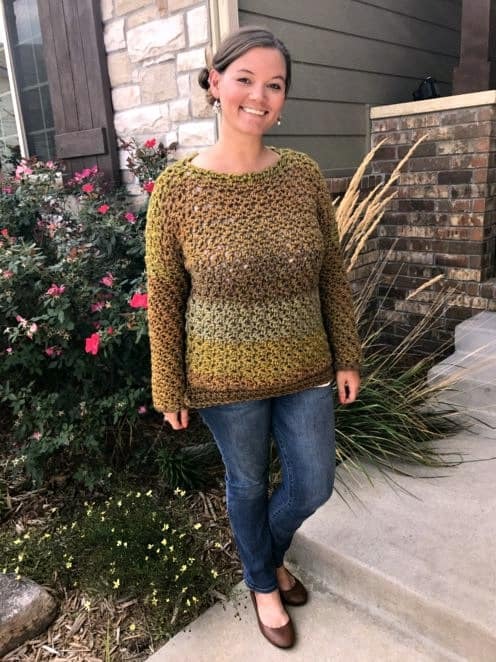 I really have fallen in love with this yarn. It is a wonderful, medium (worsted) weight yarn that is super soft, it does not split easily, and holds its shape well. They now have a chunky version too! 1. Sit at a white surface when crocheting with black yarn. Sitting at a white table (or white poster board, a white pillow, etc) under your project will really help those black stitches stand out. You will be able to see through the piece to some degree, and having that white come through the back side will make a world of difference! Here’s mine sitting on my white folding table. I love these tables so much I bought a second one – great for hosting Bunco or extra seating at Thanksgiving too! 2. Use a bright, bright light to better show stitches. My favorite combination when crocheting with dark yarn is to have that white surface underneath and my OttLite shining straight at my work. There are many different styles of OttLite lamps and lighting supplies, but any crafting lamp or super bright lamp will help. 3. Use a headlamp as a spotlight. If you’re not sitting at the table or near a lamp, a head lamp is a great way to see those stitches! I almost prefer this method because where I look, the head lamp looks, and I can super focus it straight in on the spot I’m working – with my white surface underneath, of course! 😉 You definitely won’t win any fashion awards, but it’ll get the job done! 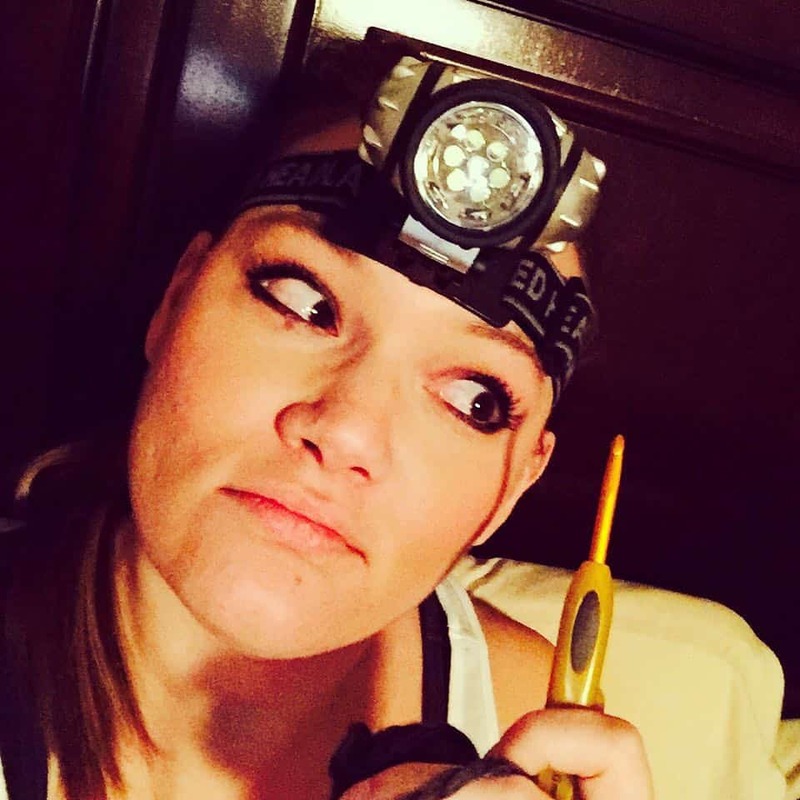 Sometimes the head lamp can be annoying (leaving a mark on your forehead, etc) and sometimes you feel like one of the seven dwarfs heading out to mine diamonds – hopefully not as Dopey. Ha! 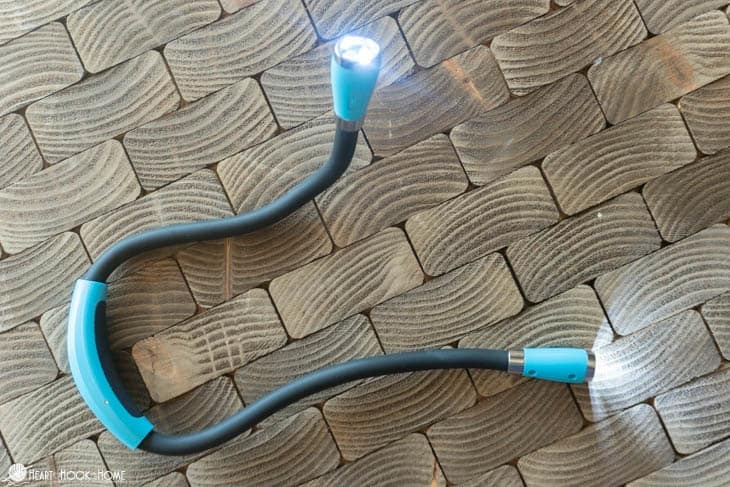 If you’re just not into head lamps, consider using a neck lamp instead! I love that this one is pose-able, has four different light settings, and is rechargeable! WIN! 5. Keep the stitches simple. When trying to decide what pattern to use, look for simple patterns as opposed to more complex patterns. The easier the pattern or stitch, the easier it will be to crochet. Bonus: since you’re using such a dark yarn, detailed stitches wouldn’t stick out anyway, so save yourself the headache (literally!) and stick to patterns using easier stitches, like the Blanket Cardigan. 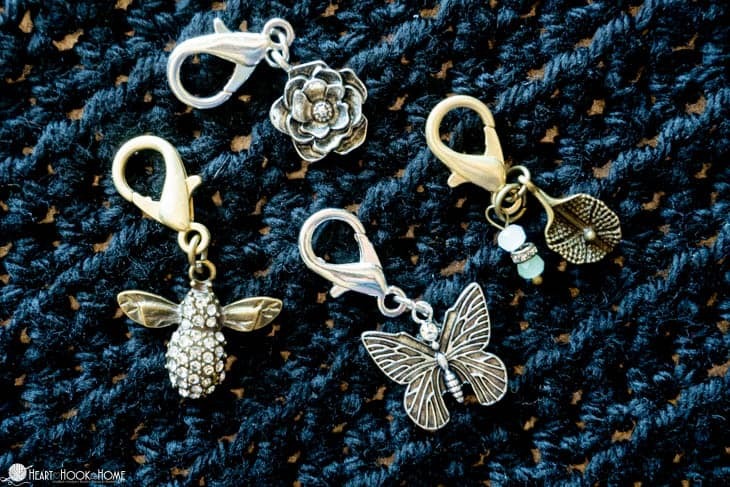 Stitch markers placed every 5 rows or every so many stitches really helps to keep you on track. There’s nothing worse than trying to find your mistake a few rows back using ANY color, much less black. Do your self a favor and keep track as you go. I am personally not a fan of the lighted crochet hooks (a girl has her favorites) but I have plenty of friends that swear by them. If you don’t have a head lamp or a neck lamp, light up crochet hooks could be a solution for you. You can get the whole set, or buy just one in your favorite hook size to test them out before investing in the entire set. Heck, they even have interchangeable light up hooks that are relatively inexpensive! 8. Wear strong reading glasses (and/or use a magnifying glass). If you wear reading glasses, wear them while crocheting – especially with black yarn. You could alternatively use a hands-free magnifying glass. Fancy! 9. Start slow until you establish the pattern. Take your time getting going on a new pattern. Trying to find a missed stitch with dark yarn is a pain, so go slow until you’ve got the stitch established. You’ll be thankful for it later. As with any crochet stitch or yarn color, counting your stitches at the end of a row is imperative. Not every single row, but definitely every few rows! 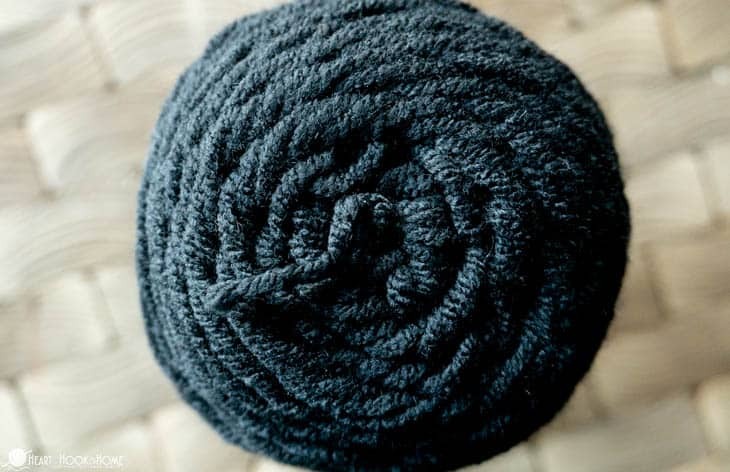 When working with black yarn, counting more often can be the difference between a finished project and an abandoned project. This is also a great opportunity to use those stitch markers we talked about earlier! 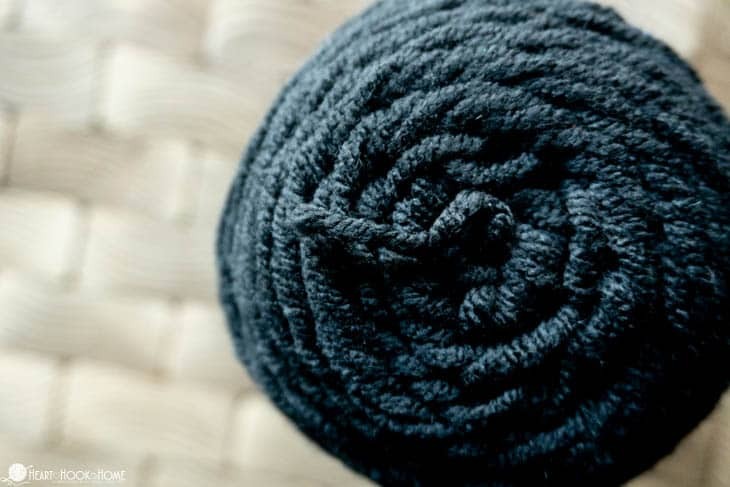 Crocheting with black yarn doesn’t have to be a pain. 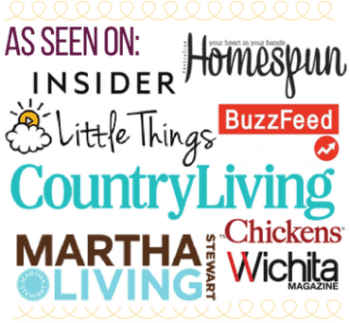 Use one or any combination of the tips above and you’ll have that project finished in no time! Another good way to work with black is during the day. Daylight is the best light for me when working on black yarn. I love your tips! Thank you. I've made black hats in the past with special patterns and you could barely see all the hard work that went into the pattern. I just recently received a request to do a black messy bun hat and your tips will make this go a lot smoother. I crocheted my roommate a Mickey Mouse hat for her birthday last year. I wish I had these tips then as it was a bear to make though she loved it so it made it worth it completely.